The Cable Matters USB-C Multiport Travel Dock with Power Delivery provides all the necessary ports to connect a thin laptop with with a USB-C or Thunderbolt 3 port. 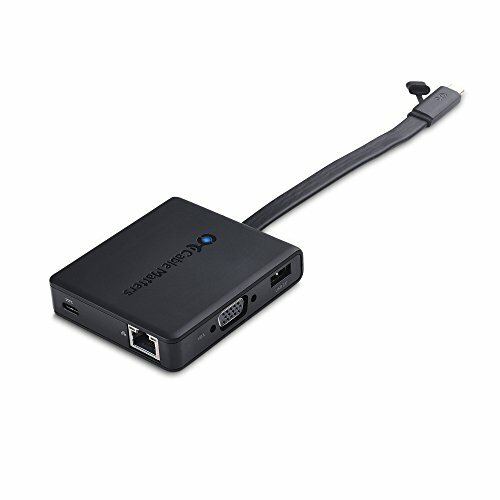 It provides instant connectivity to a choice of DisplayPort, HDMI or VGA displays, an Ethernet network, and a USB 2.0 devices such as a flash drive, keyboard or mouse. Plug & Play with no external drivers required. Connect a single display with DisplayPort, HDMI, or VGA. Always be prepared to connect to an available UHD TV, monitor or projector when traveling. Thunderbolt 3 equipped Windows computers use a USB-C port to connect Thunderbolt 3 compatible equipment. This adapter supports USB-C Power Delivery. Power and charge a laptop up to 60 watts with a power delivery equipped port and USB-C charging cable.